Discover this dazzling, diverse South American country with the liveliest and most comprehensive guidebook on the market. Whether you plan to sail around the glaciers of Patagonia or soak your bones in volcanic hot springs, taste wines in the picturesque Maule Valley or wonder at the mysterious... read more Easter Island, The Rough Guide to Chile and Easter Island will show you the ideal places to sleep, eat, drink, shop and visit along the way. -Independent, trusted reviews written with Rough Guides' trademark blend of humour, honesty and insight, to help you get the most out of your visit, with options to suit every budget. - Full-colour chapter maps throughout - so you can explore Torres del Paine National Park or the lively towns of Santiago and Valparai so without needing to get online. - Stunning images - arich collection of inspiring colour photography. - Things not to miss- Rough Guides' rundown ofthe best sights and experiences in Chile and Easter Island. - Itineraries- carefully planned routes to help you organize your trip. - Detailed coverage- this travel guide has in-depth practical advice for every step of the way. Areas covered include: Santiago, Valparaiso, Elqui Valley, Atacama Desert, Iquique, Parque Nacional Lauca, Chiloe, Pucon, Parque Nacional Torres del Paine, Puerto Williams, Easter Island, Parque Nacional Patagonia, Parque Nacional Pumalin, Carretera Austral, Futaleufu Attractions include: Travelling though the otherworldly landscapes of the Atacama Desert, Visiting the former homes of Pablo Neruda: Isla Negra, La Chascona and La Sebastiana, Sampling the nightlife in historic Valparaiso, Exploring the culture and myths of Chiloe, Sailing through the Beagle Channel in Tierra del Fuego, Spotting the moai statues of Easter Island, Wine tasting in the Central Valley, Hiking- and ice hiking - in Torres del Paine, Visiting the San Rafael Glacier, Stargazing in the Elqui Valley, Driving the Carretera Austral, Hiking in Parque Nacional Patagonia, World-class white water rafting on the Futaleufu Basics - essential pre-departure practical information including getting there, local transport, accommodation, food and drink, festivals and events,sports and outdoor activities, national parks, shopping and more. Background information- a Contexts chapter devoted to history, landscape and the environment, recommended books, music and Chilean Spanish. 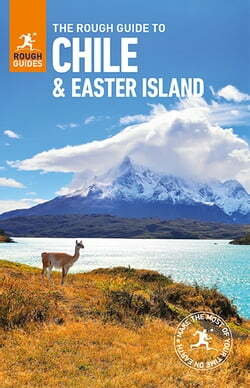 Make the Most of YourTime on Earth with The Rough Guide to Chile and Easter Island. About Rough Guides : Escape the everyday with Rough Guides. We are a leading travel publisher known for our &quot;tell it like itis&quot; attitude, up-to-date content and great writing. Since 1982, we've published books covering more than 120 destinations around the globe, with anever-growing series of ebooks, a range of beautiful, inspirational reference titles, and an award-winning website. We pride ourselves on our accurate,honest and informed travel guides.